Analysis Enterprise flash drive use will surge over the next four years due to price falls, capacity rises, NVMe speed and Internet of Things (IoT) edginess, analysts have agreed. 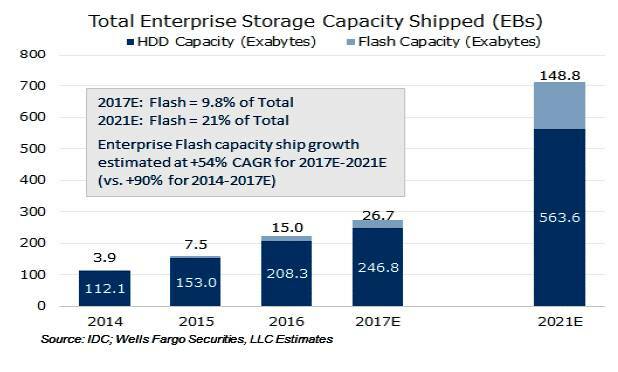 Senior bod at Wells Fargo Aaron Rakers has looked at trends and extrapolated them, and factored in flash drive supplier predictions and other research house assumptions. The trends are predicated on price declines returning after a recent hiatus, a desire to move compute closer to data (or vice versa), and the impact of NVMe. He reckons this will drive a significant inflection in SSD performance and, more notably, in capacity density. There is also a rising need for flash in IoT edge devices, such as equipment in factories, ships, airplanes, smart cities, motor vehicles, hospitals, etc, said the analyst. The price decline forecasts come from IDC, TrendForce and WDC. IDC thinks there will be a $/GB decline of 36 per cent year-on-year 2018. 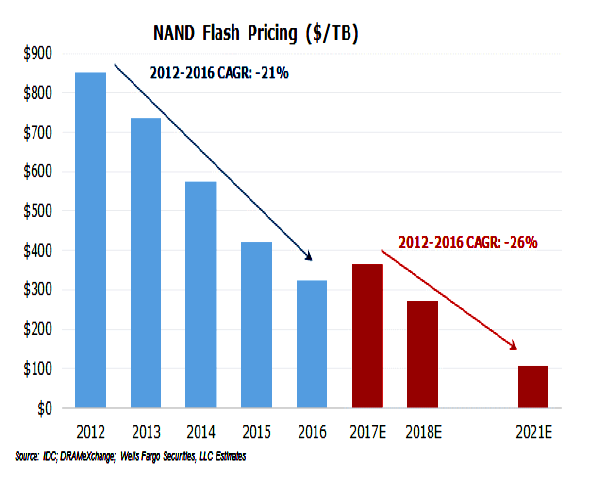 TrendForce (DRAMeXchange) recently forecast that 2018 NAND Flash price declines would be in the 10 to 20 per cent year-on-year range. Western Digital concurs with that from a 3D NAND viewpoint, and has reported having seen 3D NAND price declines in the 15 - 25 per cent per annum range. 3D NAND bits surpassed 50 per cent of total NAND Flash bits supplied in 2017's third quarter, and are estimated to reach 85 per cent by the end of 2018, so they can be a proxy for overall NAND price/bit changes. He has also looked at the SSD vs HDD premium and how it has declined by market segment since 2015. He has predicted that in 2021, mission-critical SSDs will have a 1.5X premium over equivalent disk drives, and nearline enterprise SSDs will suffer from a 10X premium, while PC SSDs will have a 1.4X premium and the overall SSD premium over HDDs will be 2.1X. He has predicted enterprise flash capacity shipment growth would be at a greater than 54 per cent rate for the 2017 (26.7 EB) - 2021 (148.8 EB) period. This would represent 457.3 per cent overall growth. 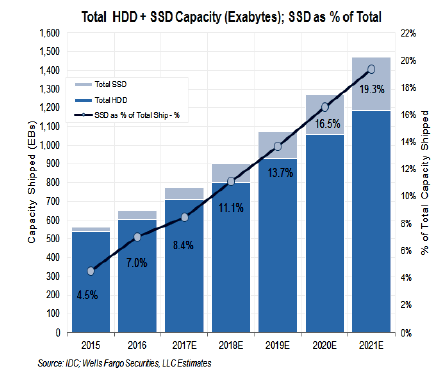 Over the same period, HDD capacity ships rise from 246.8 EB to 563.6 EB – 128.4 per cent overall growth – meaning flash capacity in enterprises is growing about three-and-a-half times faster than disk drive capacity. The future for enterprise flash drive storage is bright – meaning enterprise flash drives themselves as well as servers, hyper-converged infrastructure (HCI) systems and storage arrays. Disk-drive-based SANs and filers will be steadily replaced by all-flash arrays and all-flash hyper-converged systems, with the HCIs probably growing faster than all-flash SANs and filers. 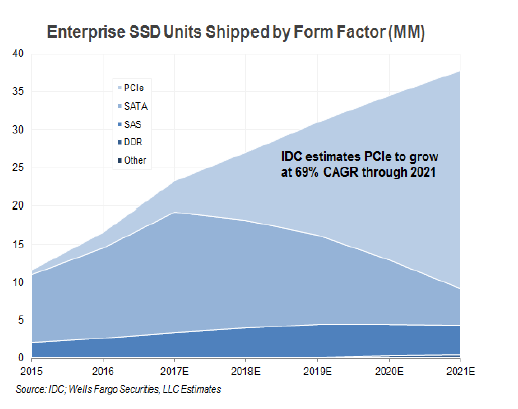 We could play the extrapolation game ourselves and ask, given these different capacity growth numbers for SSDs and disk drives in enterprises, could crossover theoretically happen? Given straight line extrapolation and enough flash fab manufacturing capacity expansion – yes, it could. But the thought exercise is futile if we wanted to know when it might happen or even if it would. Technology advances in disk drives, such as Seagate's multi-actuators, are changing the parameters of the SSD-HDD comparison game however.